Staying organize and productive when your to-do list is piling up isn't exactly the easiest thing in the world to do. I find it hard to get myself motivated and out of my lazy slump to get anything done. However, when I finally do drag myself out of bed to tackle my long to-do list. I usually have a process I do to keep myself going and get things done. 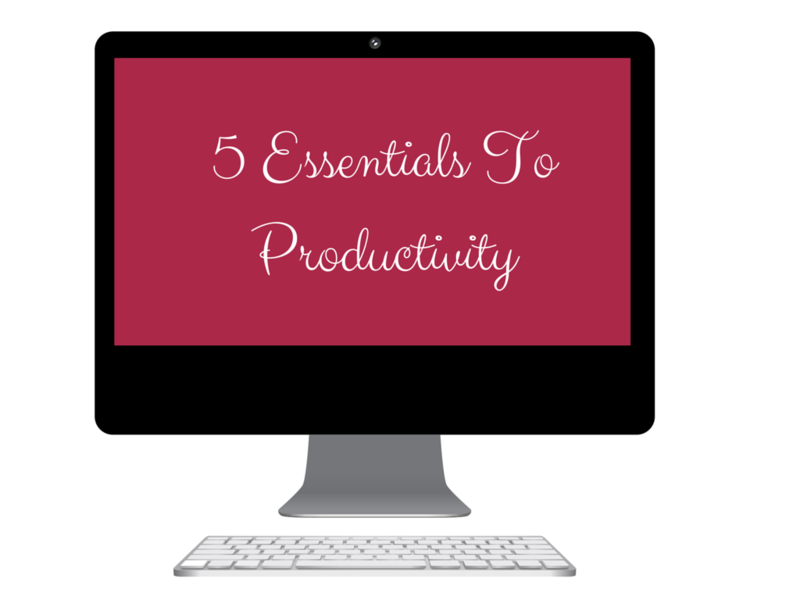 So I am going to share 5 Essentials I do to keep myself productive. 1. Decluttering Your Work Space I don't know if this is just a me thing, however I can't work in a messy space. It just adds more frustration and confusion to me. So I always make sure the space I am working is decluttered. I throw away old papers I may not need, or I'll organize papers into folders. It always makes me feel a lot better afterwards knowing that I don't have to worry about things getting lost or mixed up. I always think a clean space equals a cleaner mind. 2. Do NOT Panic: This is one thing I am usually bad at, when everything piles up from blogging responsibilities, school responsibilities, and things I need to get done at home. My brain goes a million places and it's insane. All I hear is "you need to get this done by this date" "you need to get this done too" "oh you also need to do this." With all those thoughts running through my head I tend to freak out and have the worst anxiety attack ever. I can't anything done, the proper way if I am worried about 1000 different things Recently I've learned how to kind of just calm myself down and it actually helps. I breathe in and tell myself to calm down and everything will be okay. I keep doing that till my heartbeat goes down and my mind is cleared. Meditation helps, maybe listening to some slow music, or anything that can calm yourself down. Just don't panic, you can't be productive and focus on your work if you have a million things going through your mind. This is really important when have several things on your to do list. Don't do the easiest thing first or the one that takes the longest. You need to organize your list in a way that the task that's most important or the task that has a deadline on it. It helps if you look at your planner while you're prioritizing things. I can remember a countless times I completely forgot something because I didn't look in my planner. You can set reminders in your phone calendar. I have my calendar remind me the day before sometimes you can have them remind you the week before as well. If running your business is top on your priority list, go check out Kabbage. Kabbage is an online company that helps entrepreneurs get a kick start on their business by providing them with a small business loan. Kabbage also encourages entrepreneurs to stay focus and productive. It always helps me if I have some type of music playing, it motivates me to do my work. If it's too silent I tend to get exhausted faster and want to take more breaks than I should thus enabling me to fall asleep and say I'll do it tomorrow. So always keep an upbeat playlist on while you're working, you'll see how much it affects your mood which will inevitably affect your progress and demeanor. 5. Take A Break, It's fine! I think it's easy to forget, that it's okay to take 1-2 hour break even if you don't want to take a long one 30 min is fine. It gives time to destress and do something to take your mind off all your work for a while. I think it's always good when you take a break and come back with a relaxed and refreshed mind. Never overwork yourself, take that well needed break. It really helps and is always needed. What are some of the ways you stay productive & focused?